I did not know Steve Jobs personally, but the better part of my life has been spent staring at at least one of the products created by the company he founded and led. It’s through his company and the products it’s developed that I form my opinion of the man. 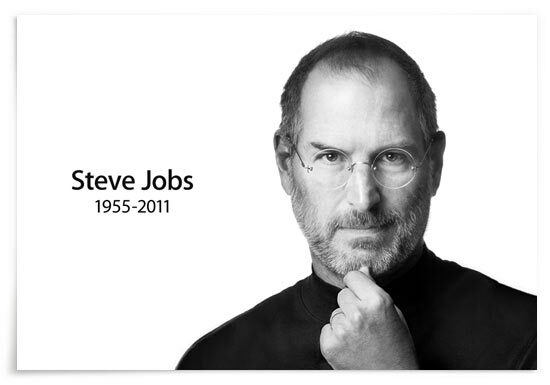 So when I reflect on the life of Steve Jobs, may he rest in peace, I’m admiring and appreciative. I’m certainly not the only one. Are you charismatic enough to attract the right people to your team? Do you have the guts to build products that people don’t know they want yet? Do you empathize enough to sweat every last detail? Have you banked a rich treasure trove of experiences? Have you taken care to cultivate good taste? Are you sophisticated enough to simplify? Will you resist the urge to list every feature of your product on the box? Do you care enough about your audience to perform for them at product launches? Will you spend money on photography, graphic design, art and music? Will you invest in things like typography? Will you be humble enough to have a sense of humour when you communicate with people? I recall an insightful comment by a keynote speaker at a design conference in Austin, TX. She said, “You are not competing against the best experience your customer has had with your direct competitors, you’re competing with the best customer experience they’ve had anywhere.” Increasingly that best experience has been with a company from Cupertino, California called Apple Inc. Under Mr. Jobs leadership Apple has raised the bar in quality product development, marketing, and management. Steve Jobs was not the only person which made Apple Inc. what it is today, but his influence was certainly a tour de force.